My family and I came to Moldova in December 2011. So far we love and out two little children love it too. It's a friendly place with good wine and many new restaurants opening! 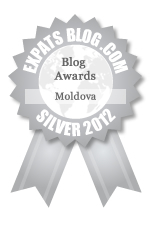 ExpatsBlog.com Expat Blog Awards 2012: Moldova Silver Award! This blog won the Silver Award for best expat blog in Moldova! Great resource to get to know Moldova from an insider-outsider perspective! Great photos, too.